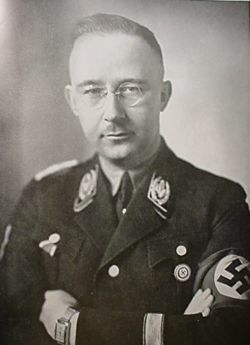 Lately, I have been reading a biography of Nazi SS Reichsfuhrer Heinrich Himmler and I am finding that reading about this man is a strange, somewhat unsettling experience. Himmler was a strange sort of man, even by the standards of the Nazi leadership who were generally an eccentric lot. He was a mystic, a crank, and a fanatic on racial matters. He hated Christianity and tried to introduce a sort of Nordic neo-paganism in the SS. He was also the one individual who was most responsible for enacting Hitler’s Final Solution against the Jews and so oversaw the greatest crimes in history, yet he was not really an evil man by nature. This seems paradoxical yet it really isn’t. There were a great many men among the leaders of the Nazi Party who were corrupt, venial, cruel, or power mad. Himmler wasn’t one of them. He was not cruel by nature, though he could steel himself to appalling acts of cruelty in order to be tough. He did not seek to enrich himself through his leadership of the SS nor did he seem all that interested in pursuing power for its own sake. He didn’t even relish bloodshed, nor was he especially eager to kill millions of people. How was it that he was responsible for the deaths of millions in the most cruel ways imaginable? The answer is simply that Heinrich Himmler was most concerned with doing what he believed was his duty to preserve the German people or volk. He sincerely believed the racist theories he propounded, that the Germans were the highest race and that the Jews were a threat to the Germans and the Slavs were an inferior race fit only for slave labor. He believed that it was necessary to exterminate millions of people for the greater good of the Aryan race. Such atrocities might be distasteful, yet they had to be done. Himmler was, in fact, greatly concerned that the acts of genocide his SS men were committing might coarsen and brutalize them and he warned them that they must do their duty despite any misgivings, but they must remain decent men. He envisaged his SS as a noble order of knights charged with an unpleasant, but utterly necessary duty. It was this impulse to serve his country, a virtue good in itself, that caused Himmler to commit his acts of greatest evil. This illustrates a truism that the greatest crimes in history are not committed by bad or indecent people, but by decent people with indecent ideas in their heads, though I might hesitate to call Himmler decent. Still, he didn’t see himself as a a bad man. Something similar might be said about his master, Adolf Hitler. Hitler was also not a decent person. Hitler really did believe the Jews to be a threat to Germany. If you discovered that a group of people were systematically undermining America, causing us to lose wars and controlling the American economy with the intention to enrich themselves and enslave every American, wouldn’t you think it necessary to exterminate such a dastardly group of people. At the very least, you might want them out of the country. Hitler’s desire to exterminate the Jews had a basic motive to save his people that might be considered good in itself. If Hitler had only been interested in acquiring power, he would have done a good deal less damage to Germany and the world. He would still have been a vicious tyrant, but he wouldn’t have killed six millions Jews. He might have gone to war to expand German influence in Europe, but he would not have sought to enslave the Poles and the Russians. It was where Hitler sincerely believe that he was going good that he did his greatest evil. Perhaps something similar could be said about the other monsters who have destroyed the lives of millions in the countries they ruled. Joseph Stalin was a cruel, paranoid tyrant, but because he sincerely believed in Marxism he killed millions of Russian and Ukrainian peasants to force them into collective farms. Much the same might be said of rulers like Mao or Pol Pot. Evil has no power in itself. It is always parasitic on good. It is not possible to commit great acts of evil unless one has the ability to commit great acts of good. Hitler had talents in oratory and practical politics that he could have used to become Germany’s greatest statesman. Himmler’s flair for bureaucratic organization could have uplift the lives of millions instead of destroying them. Lucifer was the greatest archangel until he became Satan. Evil is always more effective when it comes disguised as good. People will do terrible things in the name of their god or country or the general welfare that they wouldn’t even consider doing for selfish reasons. Perhaps this is the lesson that we must not forget. The trouble with the Nazis wasn’t that they were bad people, even though many were very bad indeed, but that even good people with bad ideas can become very, very bad. There was a depressing number of neo-Nazi/anti-Semitic articles that turned up here. It is so easy to forget. This entry was posted on April 17, 2015 at 8:10 pm and is filed under Books I've Read, Deep Thoughts, History, Scum and Villainy. You can follow any responses to this entry through the RSS 2.0 feed. You can leave a response, or trackback from your own site.